The best method for planting is direct seeding with drill equipment. If broadcast seeding is the only option then a good, fine seed bed is desirable since most of the seeds are very small like alfalfa. Ideally the soil should be disked, cultipacked with a ring roller, planted and rolled a second time. 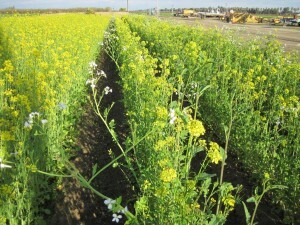 After Sept. 10th through Nov. 10th, while soil is still warm (above 55⁰) is an appropriate time to plant any cover crop in California. 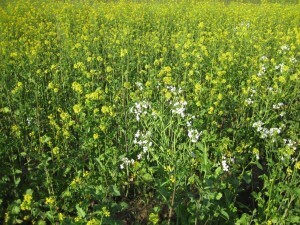 However, to ensure the cover crop will bloom before almonds it must be sown before the first rains. 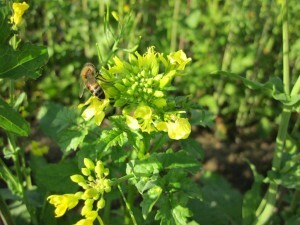 The mustard mix must be planted before October 5th. Plant no more than 1/8” to 1/4” deep. Plant in-between tree rows, fence lines, fallow areas, where trees are being taken out of production, and in orchard margins or borders. Ideally it should be mowed or disked after the stand stops blooming. If reseeding is desired leaving plants intact until June may be necessary. This date will vary depending on planting date and local climate.